100-year-old scientific hoax: Question now is, whodunnit? Who's the hoaxer? 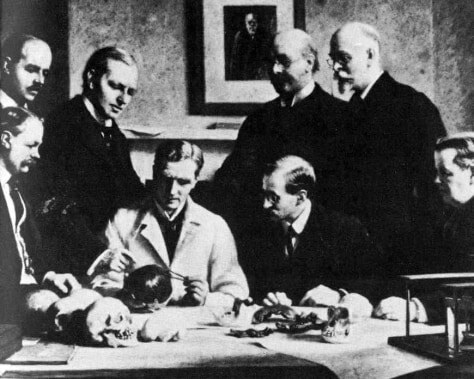 This portrait shows many of the major players in the Piltdown "discovery." In the back row: F.O. Barlow, G. Elliot Smith, Charles Dawson, Arthur Smith Woodward. In the front row: A.S. Underwood, Arthur Keith, W.P. Pycraft, and Sir Ray Lankester.